Classic Style Easel - Please choose a size. This is an acrylic display easel. This easel offers a simple way to display different products while also providing stability. The simple design of the display easel does not occupy a lot of counter space. The materials used in the construction of our display easel is high quality to ensure durability. Different sizes are made available to provide you with choices for any display situation. This is a six tiered acrylic easel with lips on both sides to hold plates of your choices. 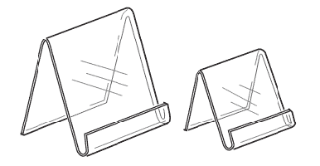 This acrylic stand has 1 1/4" openings to hold plates. Clear acrylic construction is highly durable and gives a clean professional look. This is a five tiered acrylic easel with lips on both sides to hold plates of your choices. 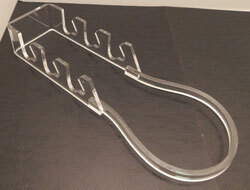 There is also an acrylic loop to hold a saucer and cup. This display for plates and dinnerware is 13 1/2" deep. An acrylic easel ideal for displaying books or other types of media. This easel features a 3" opening that is perfect for boxed items such as games or software. Backward tilt features allows shoppers a ull view of the product. Acrylic mini card easel with front lip. Available in 2 sizes. Clear acrylic construction is highly durable and gives a clean professional look. Great for use on a counter top or desk.